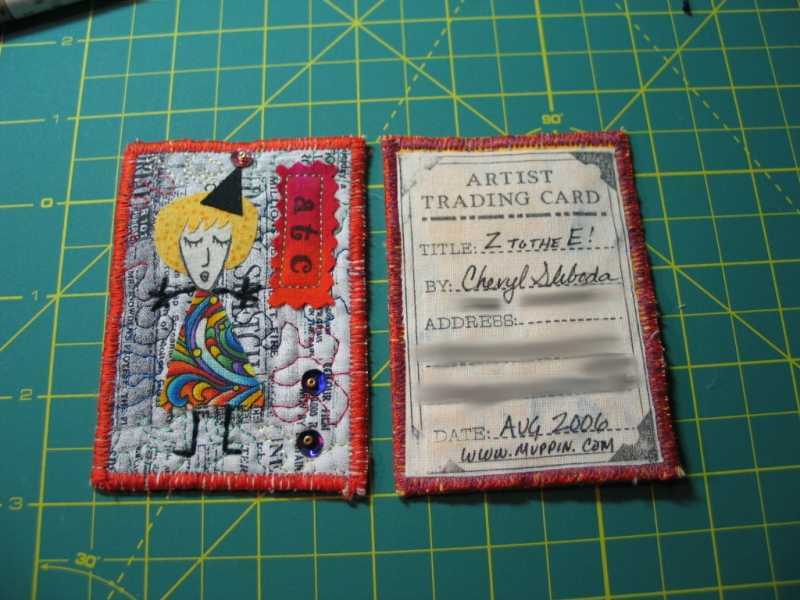 blog – Page 174 – Cheryl Sleboda – Textiles. Technology. Texture. Teacher. The theme is to take a picture and make an abstract work from it. Here is mine. I was hoping to get this done before my vacation and I’m glad I did. It’s very creepy. The picture is from our trip to the UK. The churchyard is behind the St Mary’s Abbey, a beautiful ruin from the 13th century. While walking around the back of the abbey ruins, there was an iron gate and a church and churchyard. The graves were all from the 1700’s. Here is my quilt. It’s supposed to be an abstract of the photo. I’m sending it off this week. I’m so excited. Here is step 1. 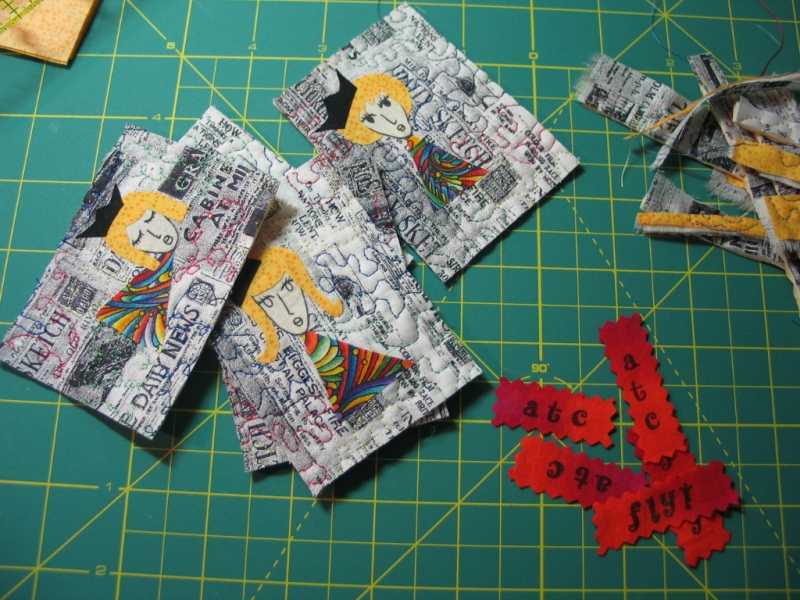 I fused fabric bits to make the little people. These cards are for the Zetti stle swap i joined on www.atcards.com. Step 3. Quilt away! I quilt my cards heavily, in this case with varigated thread. Here are the quilted cards with the back of one shown. Step 4. Trim the cards to size. 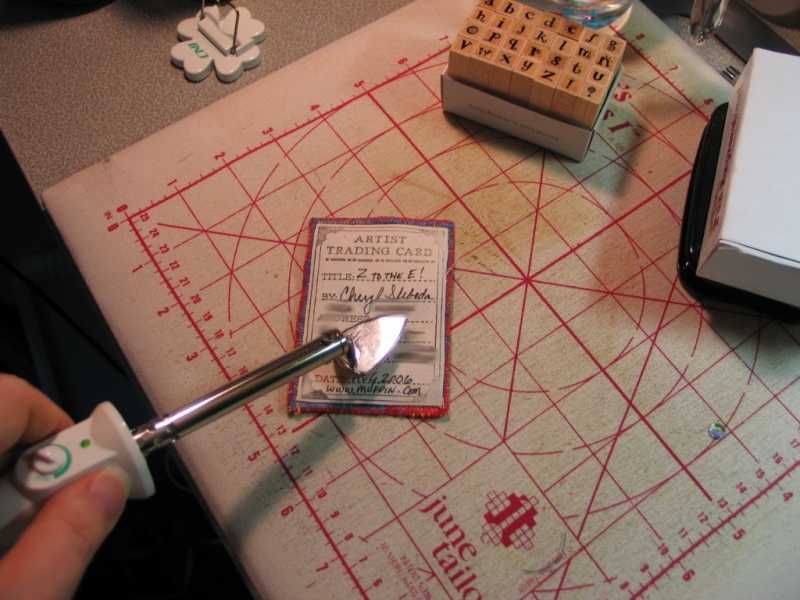 Here I taped off my ruler to the ATC size and use the clear ruler to center my design. 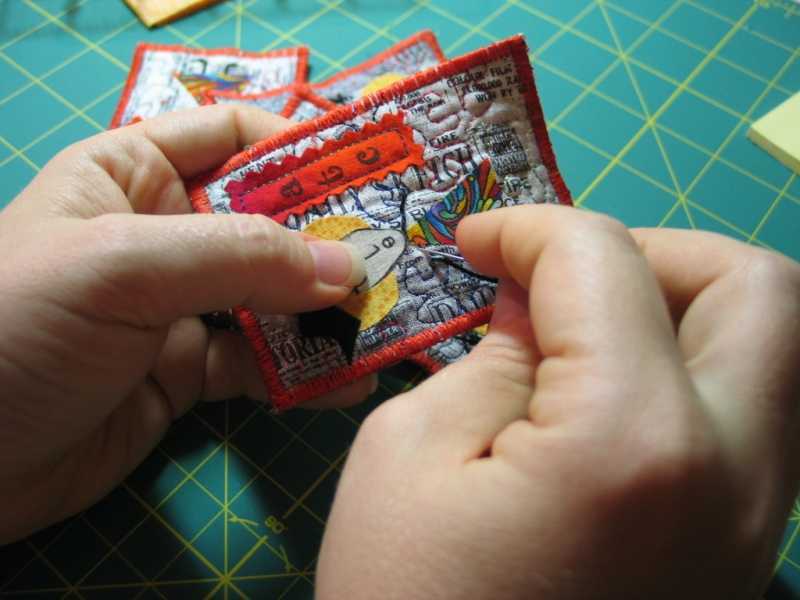 Remember that the edges are going to be sewn, so leave room! Step 5. I made some embellished words to go on the cards. They needed something colorful to make them pop. 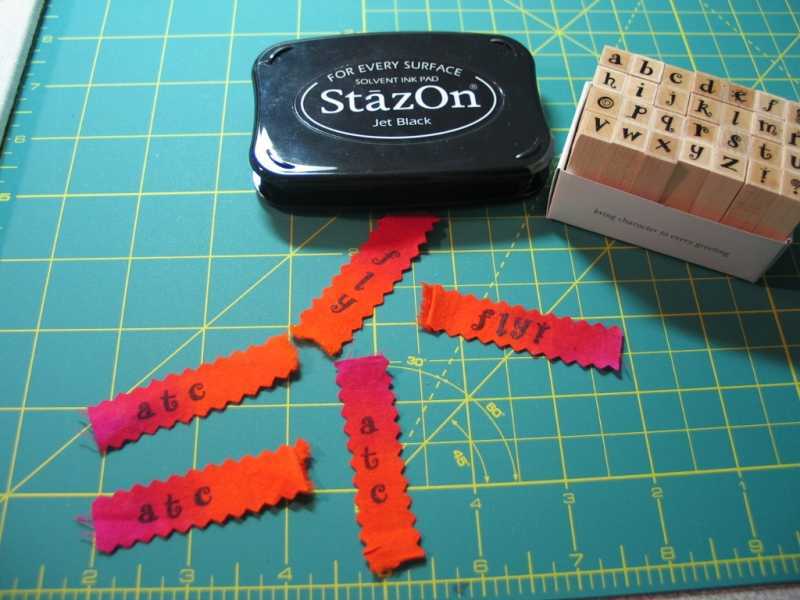 I stamped words onto small scraps. 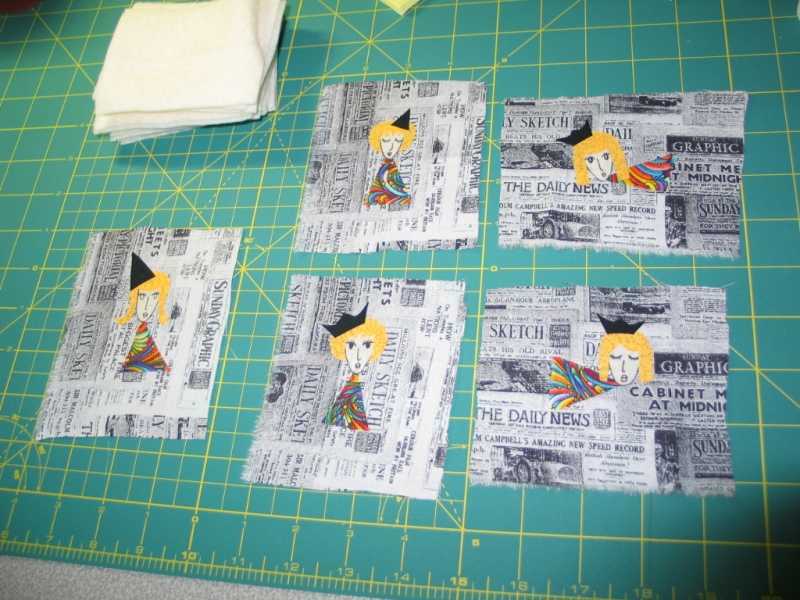 Here are the cards cut down, with the word embellishments ready to go and a small pile of scraps from cutting. Step 6. Here are the words being sewn on. Step 7. Here is the edging going on. I make 2 passes around. 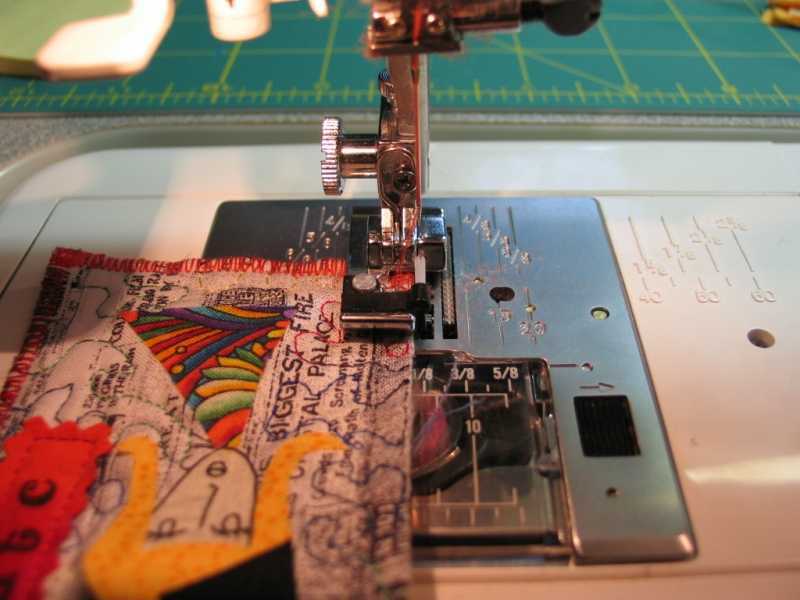 My machine is set on a 5 point width and a .80 distance on a zig zag stitch. I am using an overcast foot in order to get the zig zag to go over the edge nicely. Here are the cards after finishing the edges. Step 8. 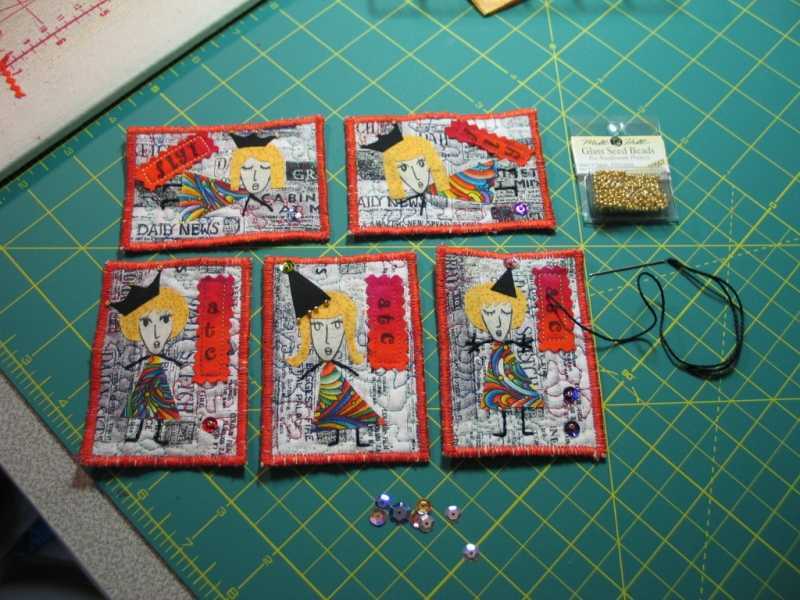 I am finishing off the front of the cards wth some embellishments. This is black perle cotton for the critter’s arms and legs. I embellished further with beads and a few sequins. Step 9. 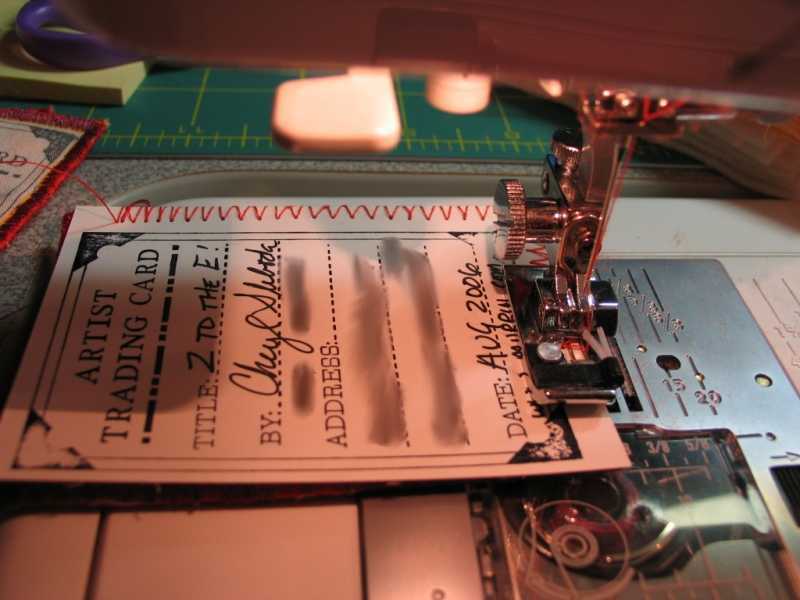 The way I finish my cards is to fuse a sticky backing onto stamped fabric, and them fuse the stamped portion to the card. Here I have stamped plain muslin with the ATC stamp, and fused “Wonder Under” onto the back. 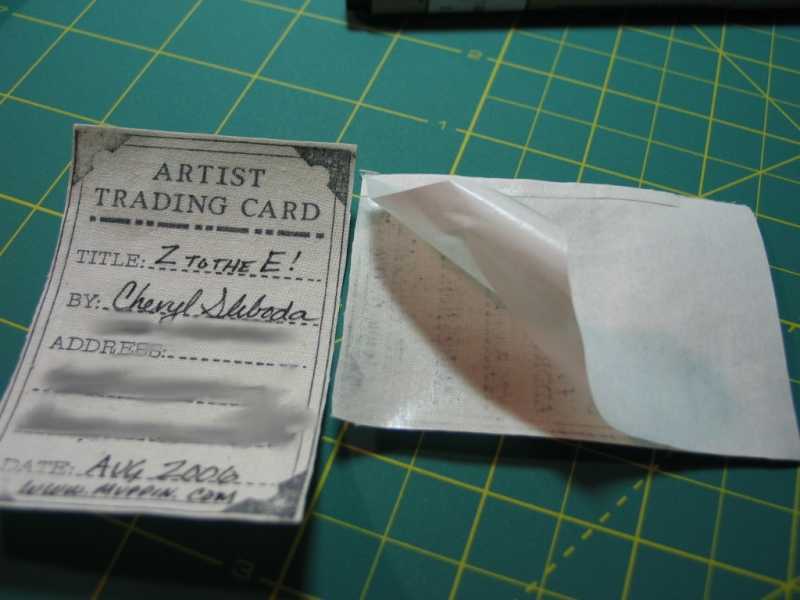 It comes with a paper backing you peel away to stick it to the back of the ATC. 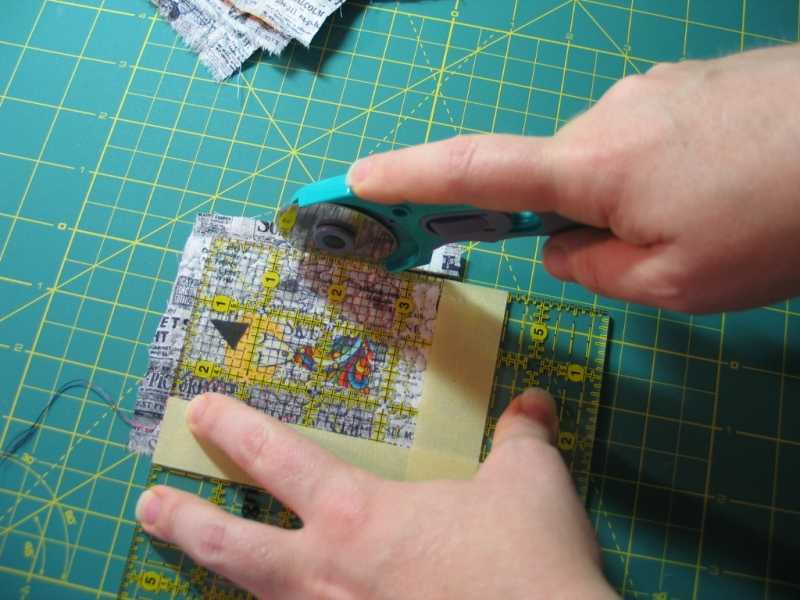 Here I am fusing it on with my mini craft iron. Finished card with fused back. It makes the card a bit stiffer than just writing on the backs. 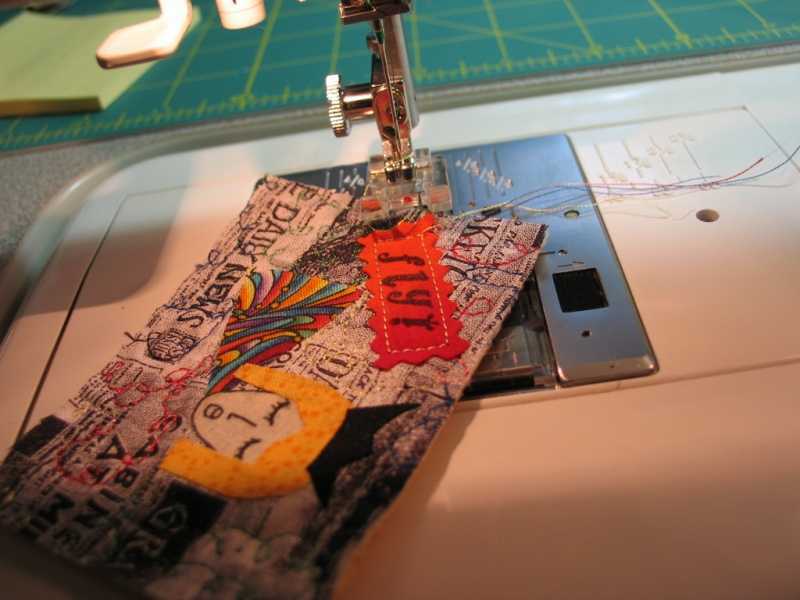 I hope this helped you make fabric ATCs! I call this Creativity Flows. I could have entered up to 5 cards. I decided to put more effort into one. 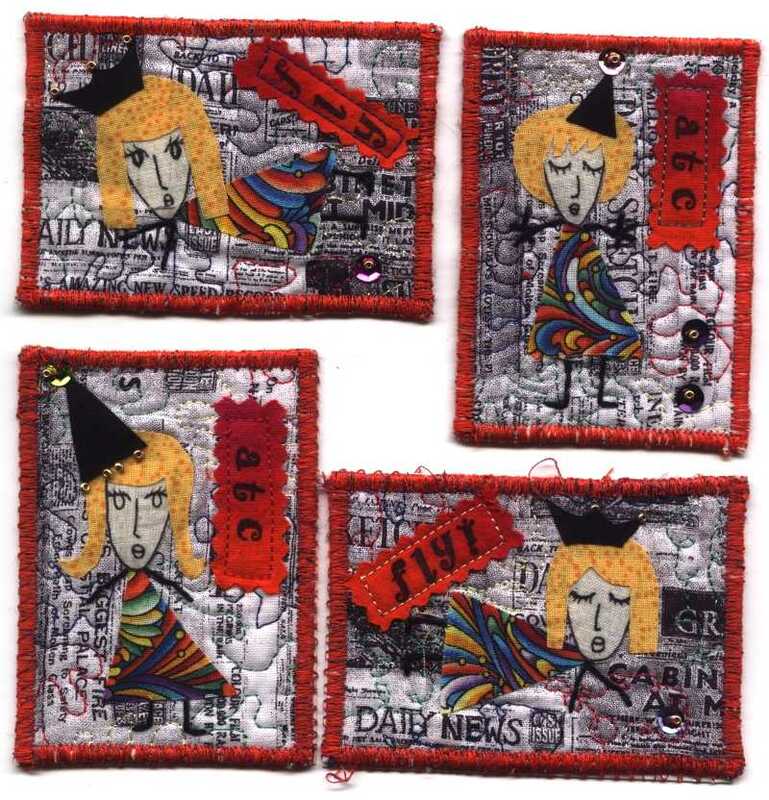 I have only ever sent in a card to Quilting Arts magazine. I hope I get to see this card again. I don’t enter many contests or exhibits, but I’m getting my feet wet. Click on the card for a larger image, I’m rather proud of it. Super kawaii…means super cute in Japanese. 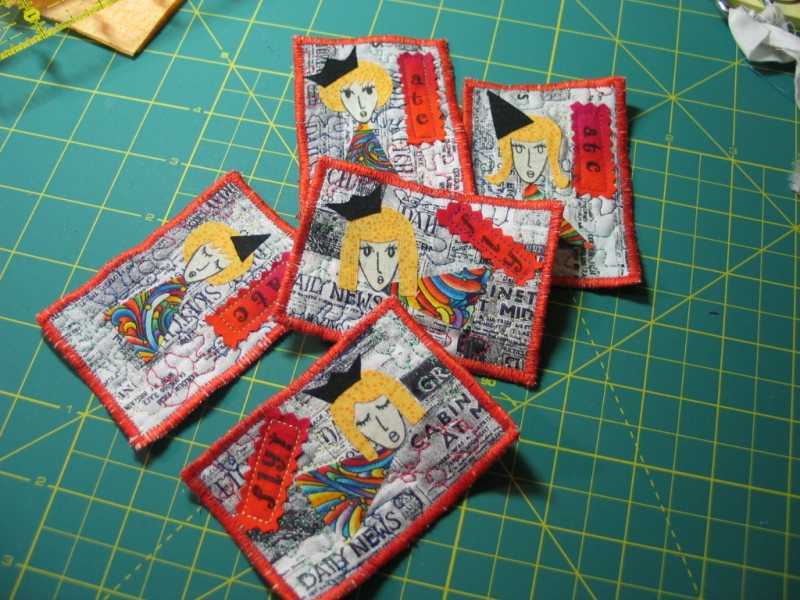 I listened to “Harajuku Girls” while making these cards. Kawaii swap in the bag! 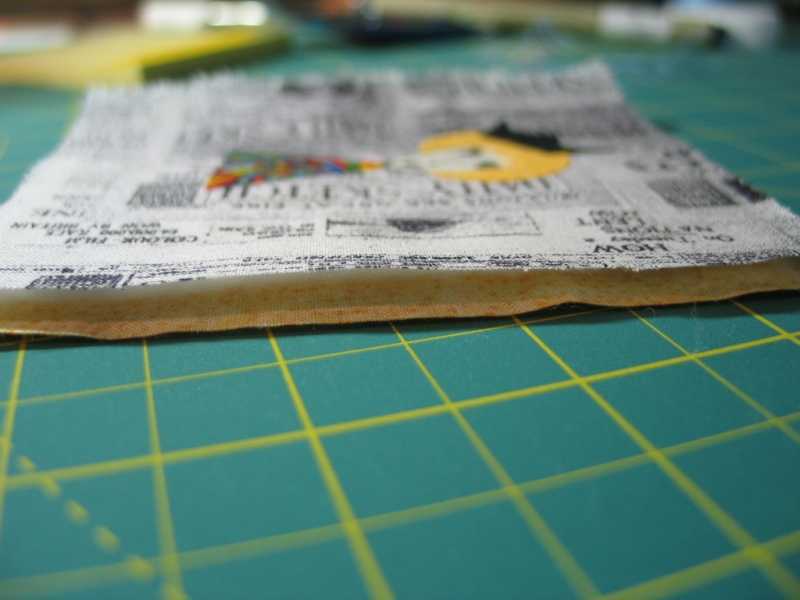 I’m running out of the fabric quickly, so no more cards from it until I make one for myself. I had fun beading them too. Now, the Zetti swap will be started tonight, as well as the skteching/beginning of a new purse, and more work on the shrine thing. I think I may have found what to do for the Precious Fabric round robin, using a Japanese Notan technique. Got this from looking up how to make wool felted beads instead of buying them. Notan is the play of light and dark, often mistaken for silhouettes. Here is a neat Notan square. I wanted to use black in the precious fabric thing, so I’ll see what happens. Aug 06, 2006 Muppin Comments Off on August is going to be busy…. Superheroes Swap in the bag. Kawaii swap is next, then the Zettiology swap. Signed up for about 10 more through Oct! Did I mention that I’m going away to Alaska for a week? NO? Well, that will take away quite a bit of free time for this hobby-o-mine…. Gotta cut back on the ATC swaps for a bit. 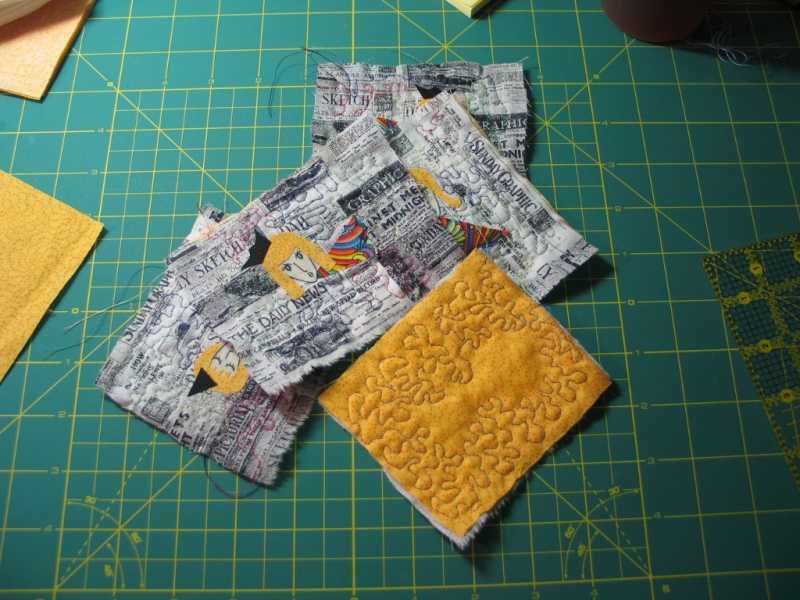 Now, the OK quilter group is doing work on Texture. Hooray! I’m going to play with that this week and get some 6″ samples done. 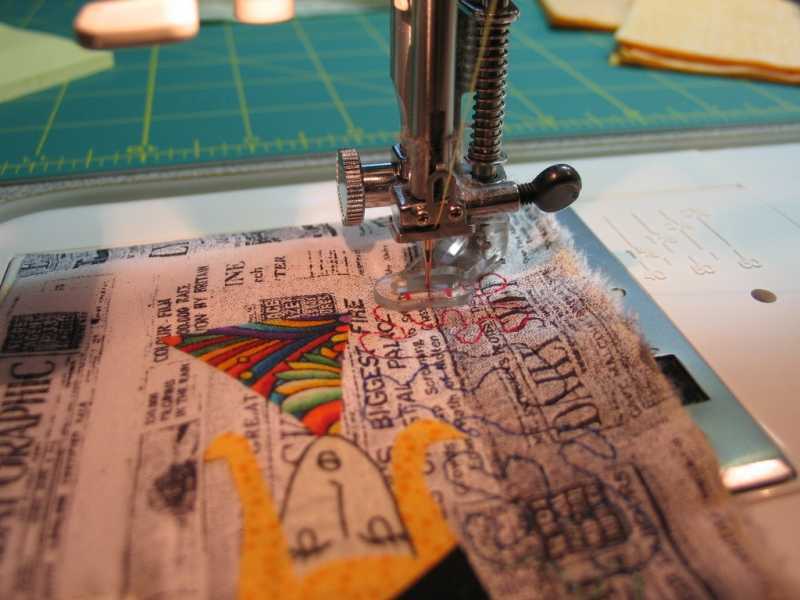 My Round Robin is around the corner the first week of Sept. Yeah, the “precious” fabrics one. I wonder what to do…. I want to do something with a lot of black. And those hand dyed fabrics of mine would look great on black. I should be working on this during my lunch hours this month.